Promise used a promotional searchlight in a manner that lay midway between memorial and celebration and marked the location of Upper Alabama Street/Underground Atlanta in Downtown Atlanta, Georgia from a distance in the night sky. In spite of what would seem to be a prime location for a historically interesting, thriving commercial environment, the Alabama Street/Underground Atlanta area seems to be barely breathing below and as much as dead at the street level. For the summer of 2011, The City of Atlanta commissioned temporary public art works for the area in an effort to revive the community and inject life and cultural activity back into an area all but abandoned since the 1996 Summer Olympic games. The most well-known examples of light beam memorial in the U.S. are the fixed, twin light beams at the World Trade Center site in New York City and the single fixed beam in Washington D.C. at the Pentagon. A more recent example (April 2011) is the single beam of light at Fort Sumter in South Carolina that split into two beams at the precise anniversary of the assault that marked the beginning of the American Civil War. On the celebratory end of the spectrum, gyrating searchlight beams in the night sky generally signify the existence of a festive, spectacular event. 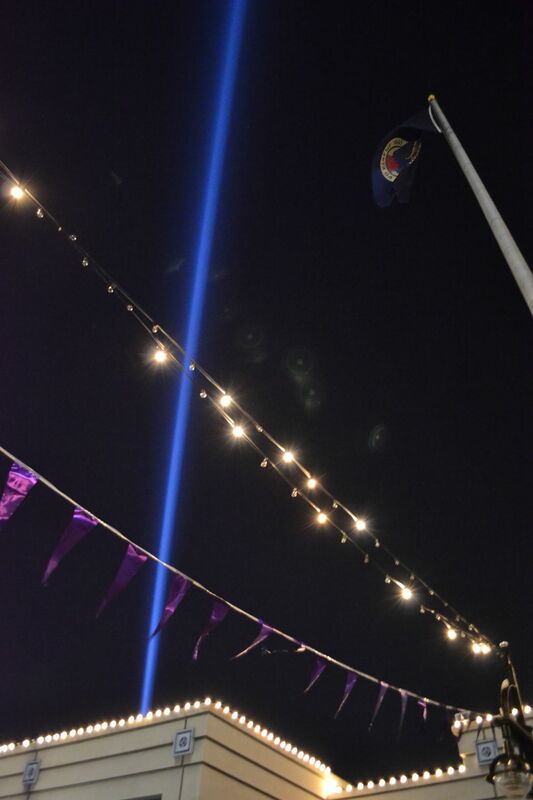 Promise involved a single vertical light beam – neither stationary like a memorial nor heavily gyrating like an event marker. The light beam projected upward and moved just enough to step away from memorial and hint that something just might be happening. The light beam had enough motion that it was clearly something other than the typical memorial, but not so much that it was clearly festive either. The ambiguity of the motion when compared to two commonly recognized uses of the light beam reflected the existing ambiguity of the space and suggested that, though in some ways it may be clinging to life, there remains hope.